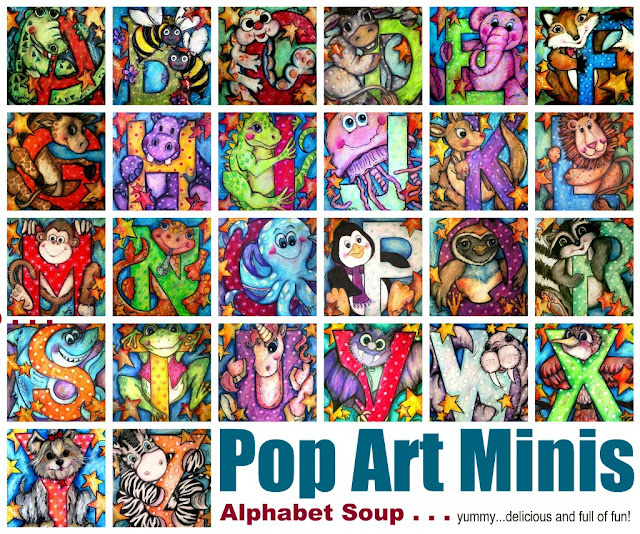 Pop Art Minis: Creative Tuesdays! I've always found inspiration in alphabet adventures and over at Creative Tuesdays the theme prompt of the week was ALPHABET! So of course I had to give it a twirl, an imaginative swirl! So with theme in my head and pencil in my hand here's a peek at my entry for the week! 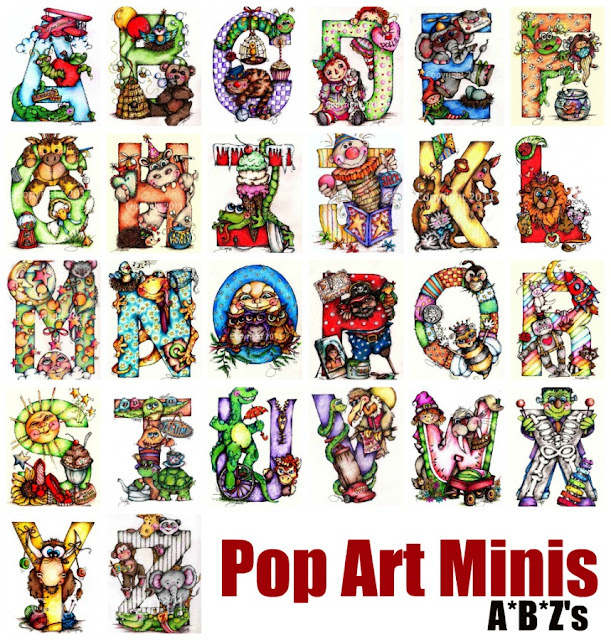 Here's a look back at some past alphabet fun! A few ABC designs that I'd already done! 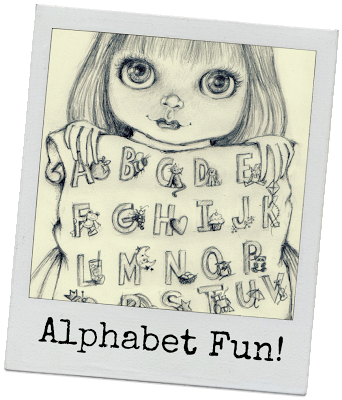 to check out all the Alphabet fun! they're all wonderful. I really the sketch and all the little drawings next to the letter. isn't it odd we always use capital letters when we list the alphabet? even I, who always like using lower cases ended up with capitals. Wow! That's a lot of drawing, I love it! Whoa, fantastic work on those alphabets, I love all of them! WOW, Joni! Utter adorable brilliance here. 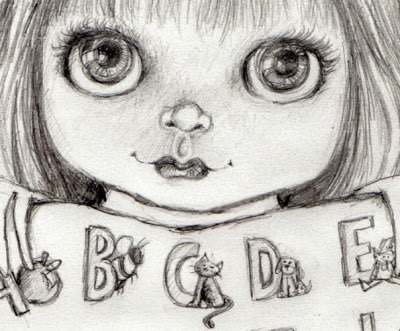 LOVE your sketch of the lil' girl and the darling little letters with illustrations. So cute and well thought out too as well as rendered! You know, I;m seeing a whole new side to your art that while seeing some of it before, is magnified here. you know what that is? It's your illustration style. Love it. Those eyes, for example are amazing. In fact, although you have really colourful stuff I think I like your drawings even better as the attention is on the strokes, vs. the colour as much. So glad you joined in and this theme inspired you as such. Thank you for finding the time and joining us here again. Hope you play along again! :)Whenever is great. Oh, wow! You're so talented! Oh my word this is fabulous! 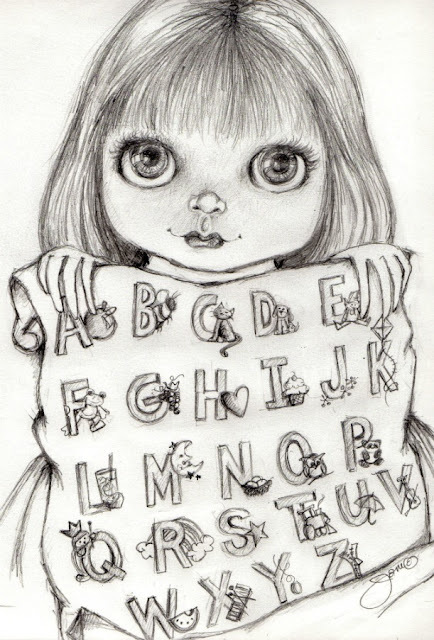 Oh wow, the alphabet is adorable!!! 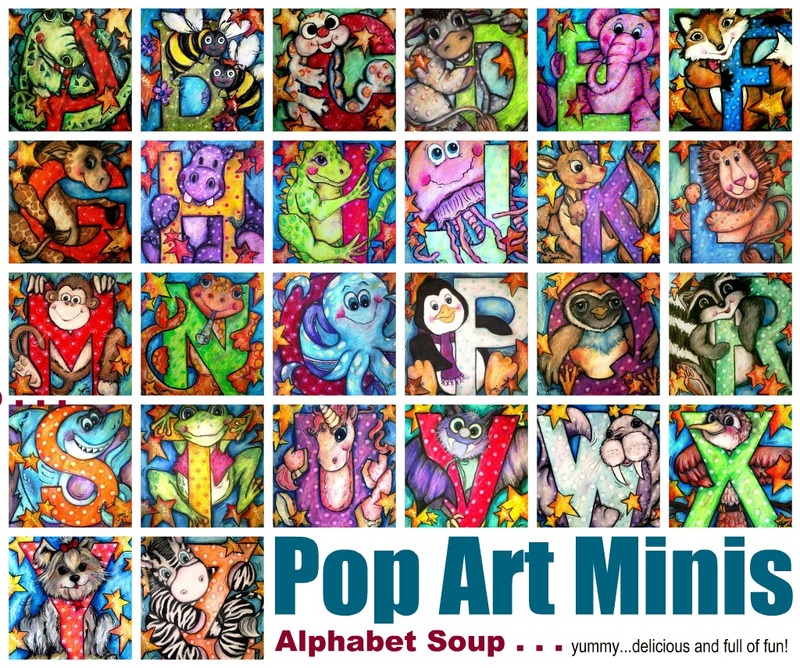 I love the colors and the funny characters! And I also love your little ladies! Your gal is a charmer. 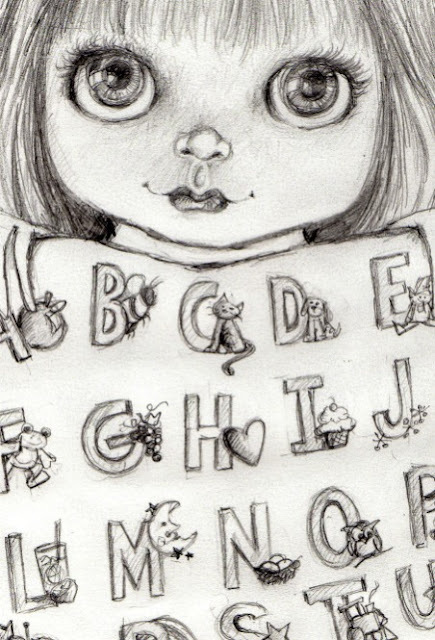 Your alphabet letters are so creative. Will this sketch be colorful too? Oh my, each one is wonderful that I am on overload or awe! Wow, this must have taken ages. It is so beautifully drawn with so much detail. 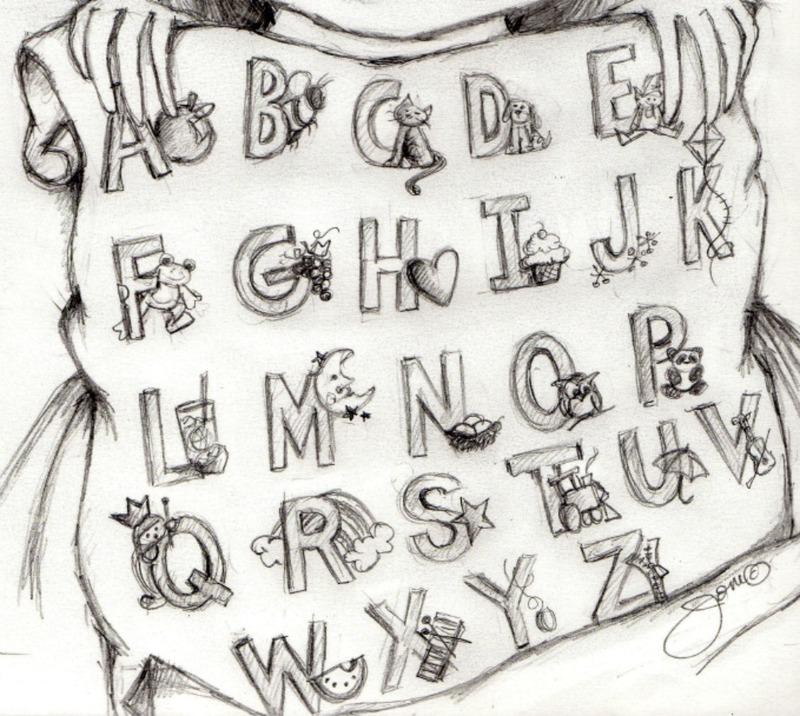 I remember your wonderful alphabet drawings which I still love. So bright and colorful!! I love these. I love love love your illustrations! this post is a feast for the eyes!